Growing up, I was creative, social, mature and kind. Those were the adjectives I preferred to use to describe myself. But a group of kids in my class had a few other monikers in mind for me – weird, nerd, wannbe, Oreo and teacher’s pet. I was teased, bullied and harassed almost daily from seventh to eighth grade. 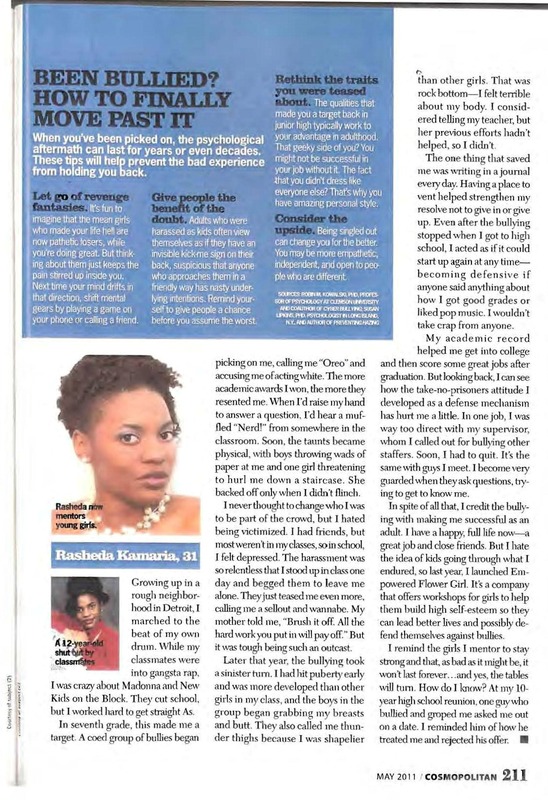 In 2011 – five years ago this month – Cosmopolitan magazine published my story in the article “Being Bullied Changed My Life.” The article focused on women who were bullied as teens – before the digital age – and how the constant taunting impacted their lives both negatively and positively. I shared my journey from excluded to empowered and the steps I took to overcome the drama. After the story was published, I received emails and instant messages commending me for my courage. Empowered Flower Girl even gained 100+ Facebook fans/followers as a result. I’m grateful for the opportunity to have shared my story publicly and encourage any who has overcome a challenge, obstacle or hardship to do the same. You never know whose life you might change or even save as a result.